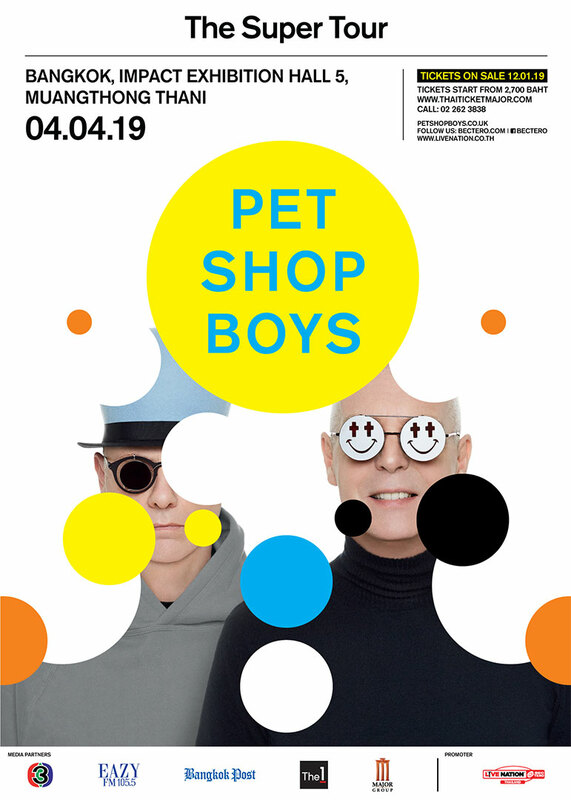 Pet Shop Boys, the iconic British electronic music duo, are returning to Bangkok with their Super Tour on Thursday 4 April 2019 at Impact Exhibition Hall 5, Muang Thong Thani. The show is presented by Live Nation BEC-Tero. Tickets for the show start from Bt2,700 and go on sale at 10am on Saturday 12 January 2019 at ThaiTicketMajor. Live Nation members get to enjoy the privilege of purchasing pre-sale tickets on 11 January 2019. Pet Shop Boys (Neil Tennant and Chris Lowe) are the most successful duo in UK music history. Since signing to Parlophone Records in1985, they have achieved an amazing 42 Top 30 singles in the UK, of which 22 made the Top 10 including “Go West”, “Where The Streets Have No Name”, and “Can You Forgive Her?” while “West End Girls”, “It’s A Sin”, “Always On My Mind” and “Heart” all made it to #1. They have released13 studio albums all of which have made the UK Top 10 as well as album charts around the world. In their live shows over the last 30 years, Pet Shop Boys havecreated an original and influential style of pop musical theatre, collaboratingwith directors, designers and artists including Derek Jarman, David Alden and David Fielding from the English National Opera, Zaha Hadid, Sam Taylor-Wood and Es Devlin. The Daily Telegraph raved about their recent world tour, “The show encompasses high culture, club culture, theatre, cinema, political satire and a mind-bending laser show” while The Times’ 5* review described the show as, “As groundbreaking as it was exhilarating”. In 2000 they received the Ivor Novello Award forOutstandingContribution to British Music and at the 2009 BRIT Awards they were presented with the award forOutstanding Contribution to Music. As writers, producers and remixers, Tennant and Lowe have collaborated, remixed or written fora wide range of artistsincluding Dusty Springfield, Lady Gaga, Liza Minnelli, Madonna, David Bowie, Yoko Ono, The Killers and Girls Aloud. Pet Shop Boys have also written the West End musical Closer to Heavenwith playwright Jonathan Harvey, produced in 2001 by the Really Useful Group. In 2004 they performed their soundtrack to the classic silent film, Battleship Potemkin,with the Dresden Sinfoniker in a free concert in Trafalgar Square presented by the ICA and have since performed it at various spectacular outdoor events in Germany, Spain and the UK. Javier De Frutos and Britain’s leading dance theatre, Sadler’s Wells. The ballet won the Evening Standard Theatre Award and was given a second season at Sadler’s Wells the following year. Over recent years, Pet Shop Boys have headlined and performed at many of the world’s most prestigious festivals, including Glastonbury in the UK, Roskilde Denmark, Sonar Barcelona, Primavera Spain, Latitude UK, Electric Picnic Ireland, Vivid Australia, Corona Capital Mexico Rock in Rio, Supersonic Korea, Coachella USA and Summer Sonic in Japan. They are looking forward to bringing their Super Tour to Asia for the first time. Tickets for Pet Shop Boys The Super Tour 2019 live in Bangkok start at Bt 2,700 and go on sale at 10am on Saturday 12 January 2019 and are available at all ThaiTicketMajor outlets or www.thaiticketmajor.com or call 0-2262-3838. Live Nation members get to enjoy the privilege of purchasing pre-sale tickets on 11 January 2019. For more information, follow us at www.bectero.com, www.facebook.com/bectero, Twitter: @BEC_Tero_Ent and Instagram: @BECTERO_ENTERTAINMENT.